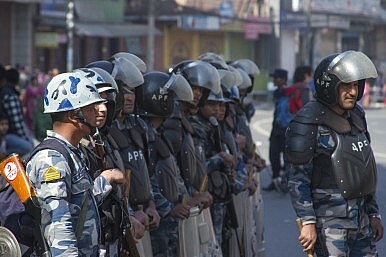 Violent protests have broken out across nepal as the Constituent Assembly nears the finalization of a new constitution. Violent protests broke out across Nepal, including in the parliament, as minority parties did all they could on Tuesday to protest the vote in the Constitutional Assembly planned this week. The violence began in the parliament in the early hours of Tuesday morning when Speaker Subash Nemwang announced a questionnaire that would precede the voting to approve the draft of the constitution. Minority party members attempted to storm the stage where Nemwang stood, and were only prevented from doing so by security guards who formed a human-fence, protecting the stage. Minority party representatives destroyed chairs and desks, and threw microphones. In the assault, several security guards sustained injuries. Currently, there is a two party alliance between the Nepali Congress and Communist Party of Nepal – United Marxist-Leninist (CPN-UML that commands a two-thirds majority in the assembly. They have the necessary votes to push through the constitution, but minority parties are protesting for consensus among all parties. Last week, a subcommittee formed to create consensus among the parties reported they had failed to do so. The meeting scheduled for Tuesday afternoon had to be abandoned after minority party members disrupted the meeting with anti-government chants. The meeting has been rescheduled for Wednesday. The minority parties called for a nationwide bandh, or shutdown on Tuesday. Across Nepal, violent protests were reported as protesters hurled rocks, burned cars, and assaulted business people who dared open their doors. The Constitutional Assembly is due to produce a draft by Thursday, but the 30-party minority alliance, headed by the United Communist Party of Nepal – Maoist is doing all it can to prevent this from happening. This assembly is the second body elected to produce a constitution for the country after the first Constitutional Assembly, which was elected in 2008, failed to produce anything.